Millennium Seoul Hilton's all day dining restaurant Cilantro is pleased to host a special sushi and sashimi promotion during the month of March, 2006. For one month only, you can enjoy an expanded selection of sushi and sashimi delicacies in Cilantro's famous buffet. Cilantro will use freshly-caught live fish (caught in the early hours of each day) for succulent morsels of melt-in-your-mouth sushi and sashimi. In addition, bountiful selections of king crab, flatfish, tuna, sea bass, sea bream, and sea squirt will fill the buffet tables for a truly magnificent feast of raw fish delicacies. The Cilantro buffet, inclusive of the Sushi and Sashimi Festival, is available for lunch and dinner. The price for the lunch buffet is 38,000 won for adults and 22,800 won for children, while the dinner buffet costs 40,000 won for adults and 24,000 won for children. Cilantro offers a special 'Sunday Brunch' from 11:30 a.m. to 2:30 p.m. every Sunday. During the month of February, the Sunday Brunch will also include the Shellfish Festival for 40,000 won for adults and 24,000 won for children. 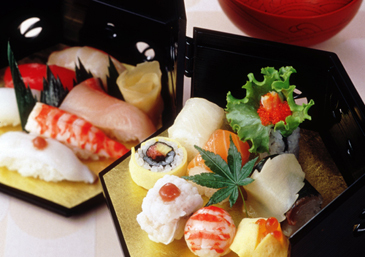 So come to Cilantro and feast to your heart's content on these exquisite Japanese delicacies! Cilantro is a bright, contemporary and casual setting serving delicious fusion delicacies from East and West. Cilantro offers a mouthwatering a la carte menu in addition to the buffet. For reservations or additional information, please call (02) 317-3062.